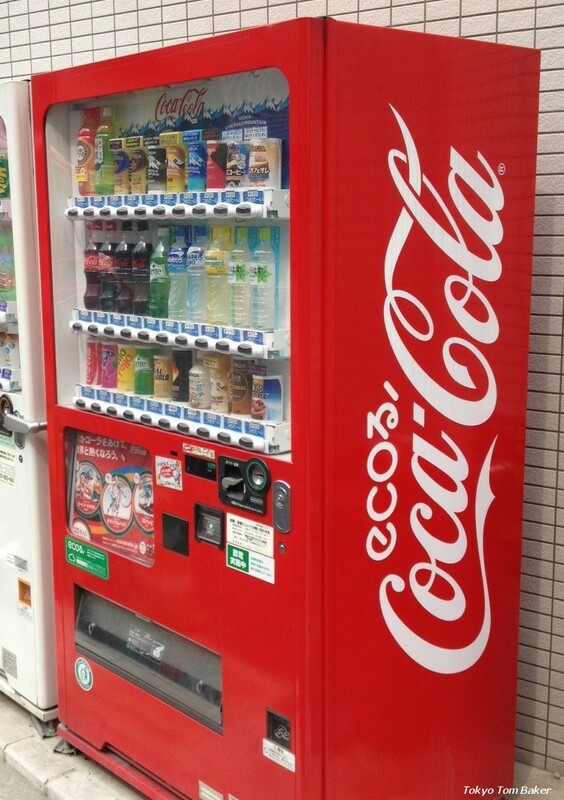 A few weeks ago, I began to notice that some of the Coca-Cola vending machines I saw on the streets in and around Tokyo had a new word painted on them: Ecoru. Lots of Japanese verbs end in the suffix “-ru.” For example, eat, think, sleep, run, throw, forget, and live are taberu, kangaeru, neru, hashiru, nageru, wasureru and ikiru. 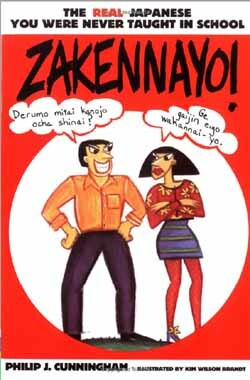 According to “Zakennayo,” a 1995 book on Japanese slang, the Denny’s restaurant chain was such a popular hangout for Japanese teens in those days that they turned its name into a verb: “deniru,” meaning “to do Denny’s.” I never encountered that word in real life myself, but I get the concept. And apparently so does some clever copywriter at the Coca-Cola company. It seems that the ecoru machines have been around for a couple of years. They involve such eco-tweaks as LED lighting and non-CFC coolants, and they claim to put less strain on the power grid by charging up in the off hours so they don’t have to draw on the public electricity supply during periods of peak demand. 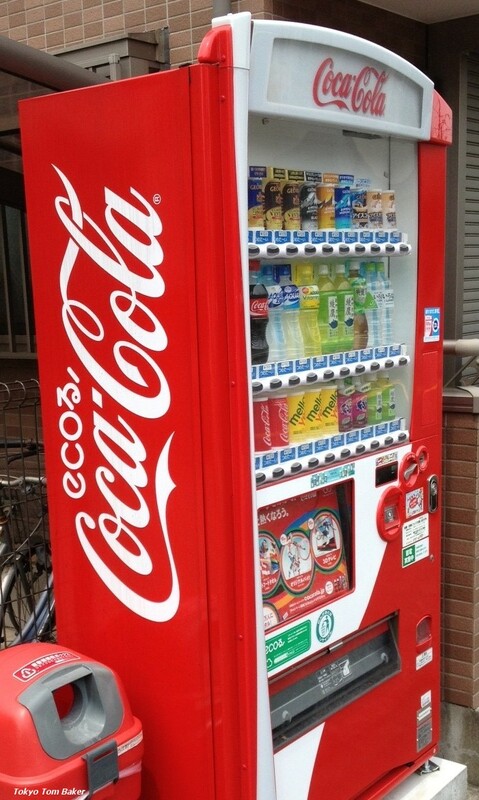 You can find technical details in Japanese at Coca Cola’s website here. It shows that some of the machines even have solar panels on top. I haven’t seen those yet. Condsidering what a big business vending machines are in Japan, this looks like a step in the right direction. Japan has often been considered a tough nut for foreign businesses to crack. In 1993, the Australia and New Zealand Chamber of Commerce in Japan decided to do something about that by establishing the Japan Market Expansion Competition, or JMEC. Now supported by 16 foreign chambers of commerce in Japan, it’s a contest in which businesspeople vie to see who can come up with the best plan for a foreign company to successfully introduce a product or service to the Japanese market. Earlier this month, I attended the awards ceremony for the 17th annual JMEC in Tokyo. There were 10 teams this year. The photo above shows the winning team holding a glass trophy moments after their victory was announced. They had impressed the judges with a business plan they had come up with for Sumitomo 3M Ltd to introduce a certain new product to the Japanese market. From the comments and demeanor of the people I saw and spoke with at the event, JMEC sounds like a kind of business boot camp (but in a good way). It was a four-phase program that began in November. 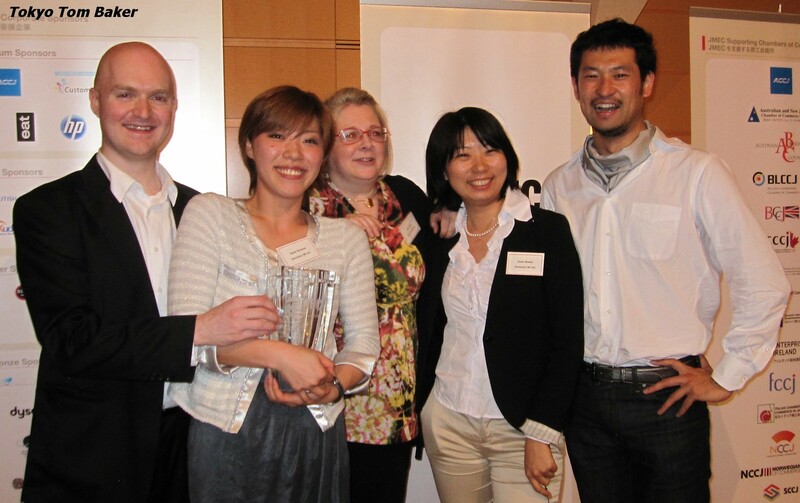 In Phase 1, the participants – young or young-ish businesspeople officially described as “English-speaking Japanese and non-Japanese individuals living and working in Japan who have a genuine interest in improving their business skills, broadening their business network and achieving higher career and personal goals” – attend a series of lectures and workshops by more experienced individuals. This year there were 20 such presentations, on topics such as market research, financial analysis, public relations, meetings and business writing. Rikkyo University Prof. Roy Larke taught the participants about distribution in Japan, Thorsten Meyer of J Walter Thompson spoke about communication, Second Harvest Japan CEO Charles McJilton described how his NPO became a success, and so on. “You can read books about Japan, you can read articles, you can watch TV, but if you get lectures from people who are actually out there doing things – who have actually had hands-on experience in the Japanese business environment – that kind of advice is much more valuable than any book or any lecture by an academic that you could go to. So I think that was probably one of the best things about it, the fact that you had lectures from people who know what they are doing,” Fensom said. After the classroom portion of JMEC, comes Phase 2, in which participants are divided into teams of five or six and assigned to write a business plan for a real-world company that wants to accomplish something in Japan. The firms involved this year included not only the giant Sumitomo 3M but smaller companies such as Internet phone-system provider PBXL and Finnish log home builder Honka. There was even one charity, the Tyler Foundation. According to the JMEC judges, each team spent a total of about 1,400 hours working on their business plans from January to April. One team put in nearly 2,000 hours. That’s the boot camp part. But if the plans are good enough, they may be put into actual use. Most of the results are protected by nondisclosure agreements – to my own personal dismay – but JMEC does boast publicly about a couple of past projects. One business with its roots in a JMEC project is GoLloyds, a wire transfer service of which I have been a satisfied customer for years. When I first came to Japan, I had to use postal money orders to send money to the United States. It was a slow and tedious process. But as a GoLloyds customer I can send money to my U.S. account just by pushing a few buttons at a Japanese ATM. In Phase 3, the participants make their presentations to a panel of judges. Phase 4 is the awards ceremony. The companies and individuals involved in JMEC must pay to participate. The cost this time was 1.2 million yen for a company and 125,000 yen for a person. JMEC finances also include money from the sale of raffle tickets at the awards ceremony, which usually goes toward the following year’s expenses. But “this year was an exception and we are pleased that we have raised 575,000 yen to go toward helping SMEs [small to medium-size enterprises] in Tohoku, which is in the JMEC spirit of helping mostly SMEs thrive in the Japanese market.” The money referred to here was given to an entity called Tohoku New Business Conference. Hopefully it will contribute to the economic recovery of that region, which was devastated by the March 11 tsunami. Although the JMEC participants are not paid for their labors, they learn a lot and they make potentially valuable connections. According to the JMEC site, at least one participant got a job as a direct result last year, when the company Instant UpRight hired Mari Yamakawa to help implement the plan she and her JMEC team had come up with. Even though it was hard to find participants this year who were willing to speak on the record – those darn NDAs – most seemed to think the experience had been worthwhile.